If your office depends on a laser printer, any problems that crop up can throw off productivity. If your black and white or color printer suddenly starts producing prints with smudges, and you don’t employ a regular printer service, you’ll have some troubleshooting on your hands. Laser Line is one of the leading printer service companies in the Mid-Atlantic, with locations in Jessup, MD, and Manassas, VA, and an operational range covering both states and the District of Columbia. Below they explain a few steps to troubleshoot smudges produced by your laser printer. The fuser unit in your laser printer is responsible for fusing the ink onto the printed page. It does this by heating the toner, causing it to melt and adhere to the page. Problems with the fuser can result in incomplete curing and an inky buildup on the fuser surface itself, which often produces smudges. One way to determine if your fuser is involved is to feel the smudges with your fingers. If the ink rubs off, smudges further, or feels grainy or loose, it’s likely that your fuser is malfunctioning. Toner problems can produce a variety of symptoms. First, look inside your color printer and find the transfer belt. If you see a smudge on the transfer belt that matches what you see on your printer pages, you likely have an issue with toner. Does the smudge repeat itself at regular intervals on the page? If so, there may be a problem with your toner cartridge. To check, replace the current cartridge and see if the pattern disappears or changes at all. Do the smudges always appear in a particular color? If so, they likely stem from one of your toner cartridges. 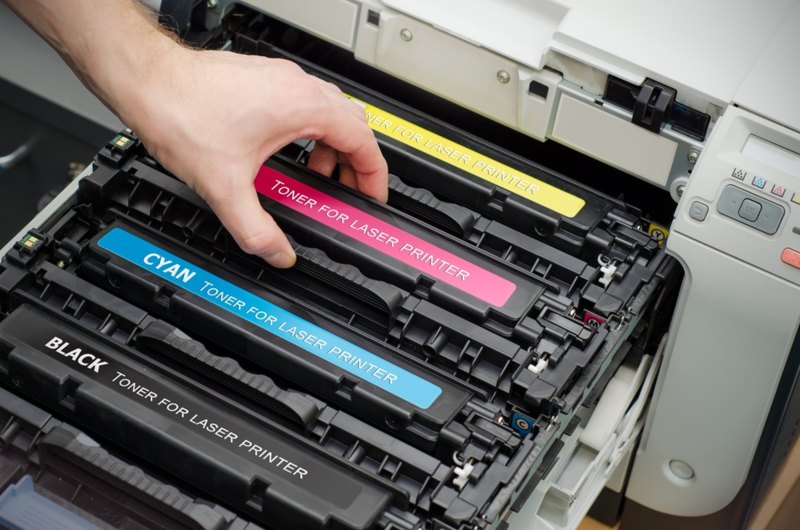 You can tell which by the color of the smear — if it’s yellow, you likely need to replace your yellow toner cartridge, if cyan then cyan, and so on. If replacing the faulty unit doesn’t seem to be solving your problems with smudges, you likely need to contact tech support or a trusted local printer service. Often, the same troubleshooting procedures that might lead a professional to a solution can come up empty in the hands of your office personnel. Fortunately for businesses in the Mid-Atlantic area, Laser Line offers managed print services to provide headache-free printer service integrating supply, service, and repairs. Visit their website to find out more about managed print services or call (410) 636-1700 today!